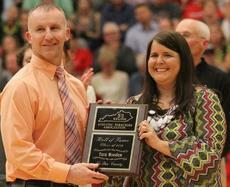 Tara Wooden, veteran cheerleader coach at LaRue County High School, was surprised when she found out that she had been named as the first female to be inducted into the Fifth Regional Athletic Directors’ Hall of Fame. 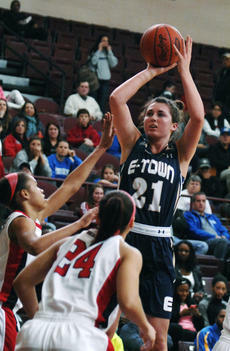 Erin Boley of Hodgenville, a standout player for Elizabethtown High School’s basketball team, was named the Gatorade Kentucky Girls’ Basketball Player of the Year on Thursday, becoming just the third player in the state to win the award in back-to-back seasons. 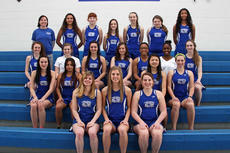 BOWLING GREEN — Elizabethtown’s dream season turned into a nightmare Friday afternoon. The Lady Panthers rallied from an eight-point deficit to take a 40-39 lead with 22.1 seconds left on senior center Reauna Cleaver’s old-fashioned three-point play in the Houchens Industries/KHSAA Girls’ Sweet 16 State Tournament. 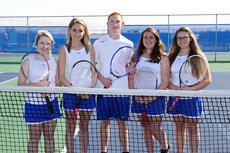 March 17 John Hardin H 5:30 p.m.
Senior members of the LaRue County High School tennis teams are from left, Rachel Wolf, Cayleigh Allen, John Michael Lawler, Caitlin Lewis and Madison Lee. 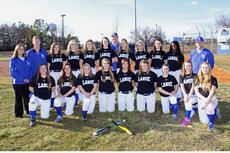 Members of the Lady Hawks Softball Team are front from left, Emma Bell, Bryanna Keith, Jill Hughes, Trishtian Cruse, Sierra Mullins, Emillee Cundiff, Kourtnee Davenport, Lindsey Shelton, Megan Cochran; back, assistant coach Christy Ferguson, assistant coach Roy Walker, Kellee Cundiff, Chasity Bryant, Delany Eastridge, Presley Brown, Head Coach Rocky Cundiff, Kaitlyn Warnshuis, Brittney Blair, Autumn Riggs, Shakeya Washington and assistant coach Vince Carpenter. 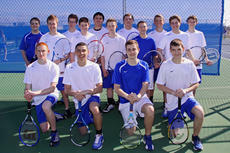 Members of the Hawks’ tennis team are front from left, John Michael Lawler, Alex Best, Harrison Hynes, Ethan Wood; middle, Samuel Lewis, Rylee Greenwell, Sean Smith, Dylan Grimes, Cole Constant; back, William Allender, Cole Lucas, Damon Lei-Sam, Jake Gardner, Preston Howell and Josh Adams. 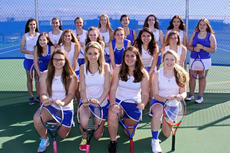 Members of the Lady Hawks’ tennis team are front from left, Madison Lee, Cayleigh Allen, Caitlin Lewis, Rachel Wolf; middle, Christina Hardin, Mallory Williams, Natalie Wolf, Marisa Cecil, Bella Garcia, Madison Eads; back, Mary Gearon, Noel Sarhan, Karrington Donahue, Chloe Childress, Celeste Menard, Ripley Lucas, Alexis Puckett and Kalli Flanders. North Hardin’s Jake Burroughs was quick and certainly effective Tuesday during the opening two rounds of the KHSAA State Wrestling Tournament in Lexington at the Kentucky Horse Park’s Alltech Arena. North Hardin’s 126-pounder moved to 18-4 on the season with a pair of first-minute pins — downing Louisville St. Xavier’s Kaden Darbro in 49 seconds before topping Belfry’s Dalton Lowe even faster in 26 seconds — to earn a berth in today’s third round.